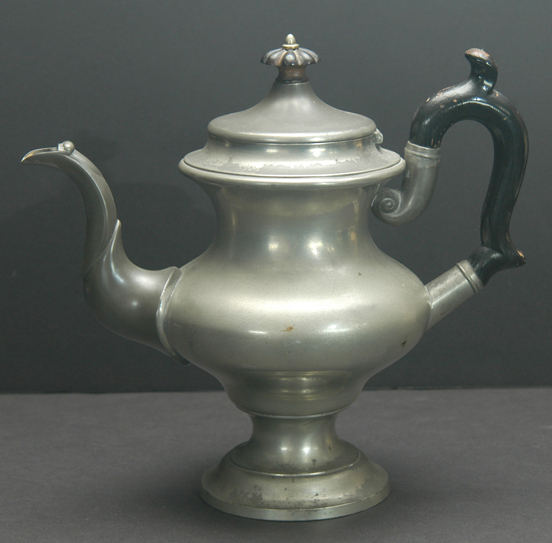 From the recently acquired local collection of American pewter comes this Britannia tall coffee or tea pot by Leonard Reed & Barton of Taunton, Massachusetts. 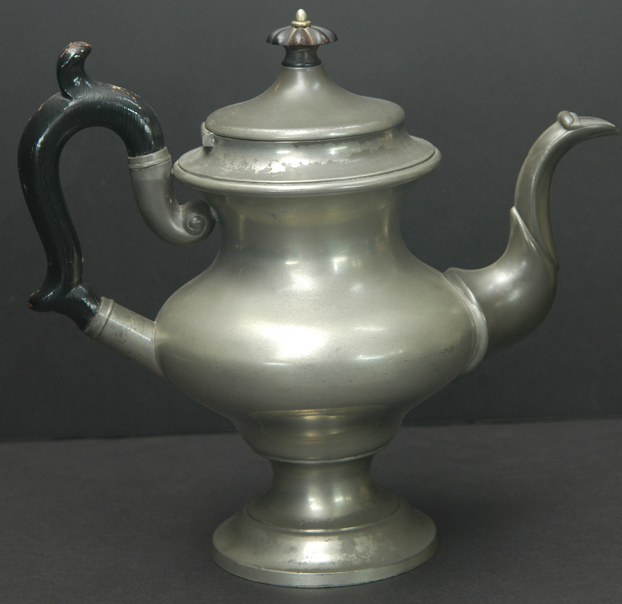 Britannia began to be used by English pewterers before 1750 when they discovered that adding antimony to the alloy compound used for pewter allowed for a stronger, lighter weight alloy that was easier to work with. However, American pewterers seemed unaware of the benefits of Britannia until the 19th century. 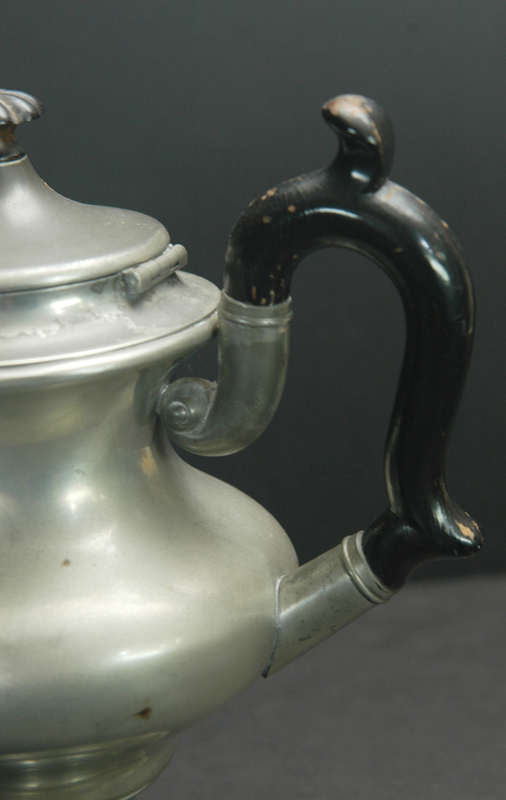 Once the American pewterers found their own favorite recipe for Britannia, the era of the coffee-pot was born. 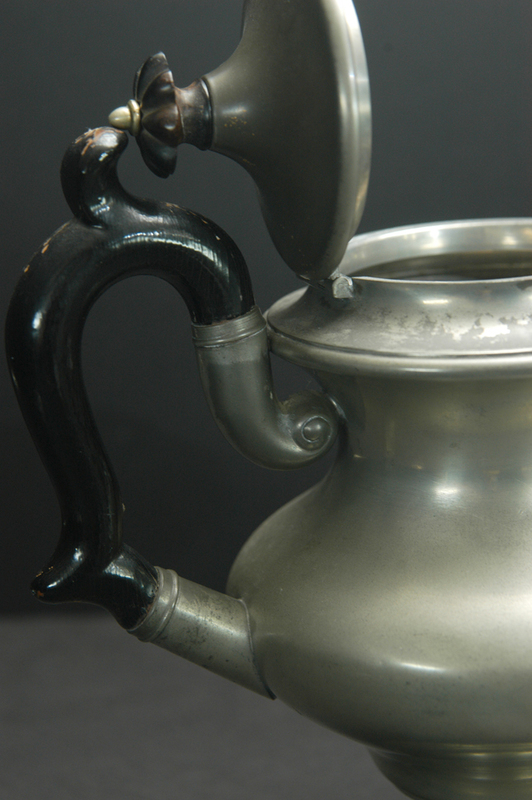 Some makers called their ware Britannia but, often, makers continued to call it pewter. 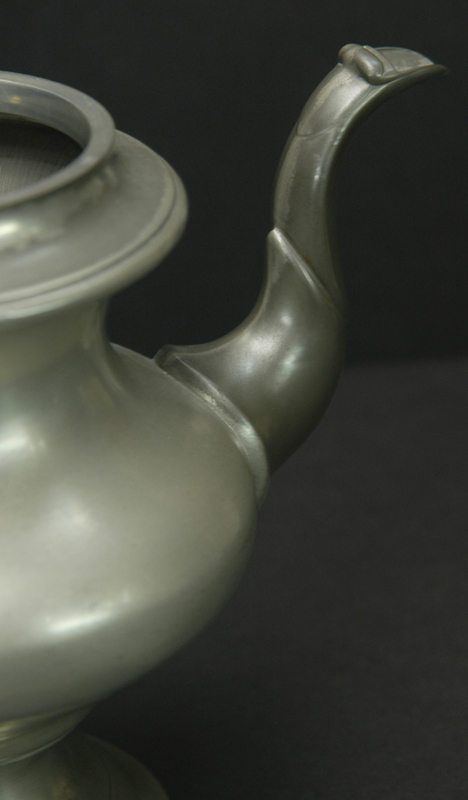 Today, collectors often assume they have pewter when, in fact, they are collecting Britannia. In other words, the difference is often academic. 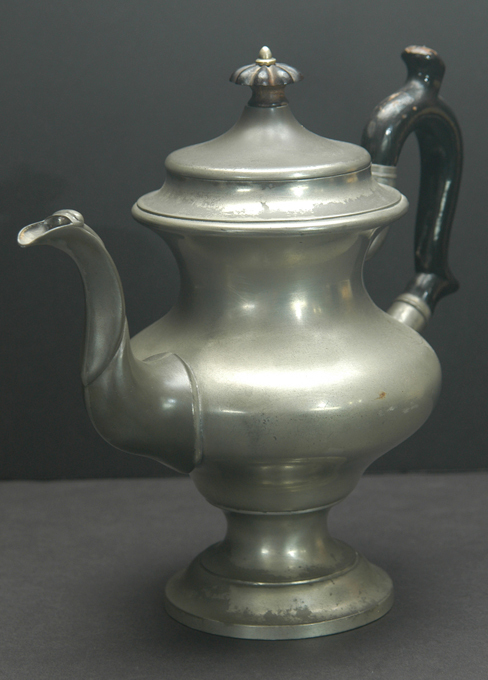 This is an American tall coffee or tea pot made of Britannia, about 10" tall. 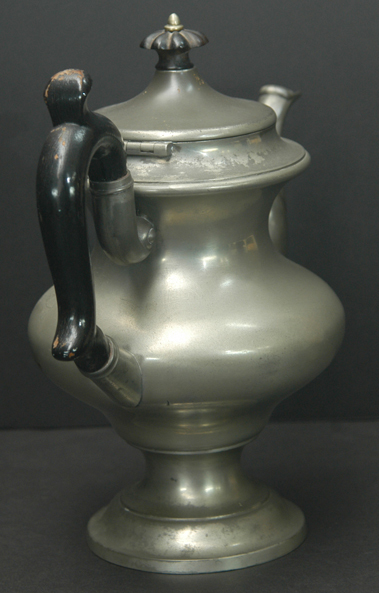 It has a wood finial, held in place with copper stem which is screwed into a pewter 4-armed bolt. The copper leads me to believe that the finial may have been put back in place--the wood finial looks period but it is possible that it is a very good replacement. The black wood handle has a few scratches and appears to be original. 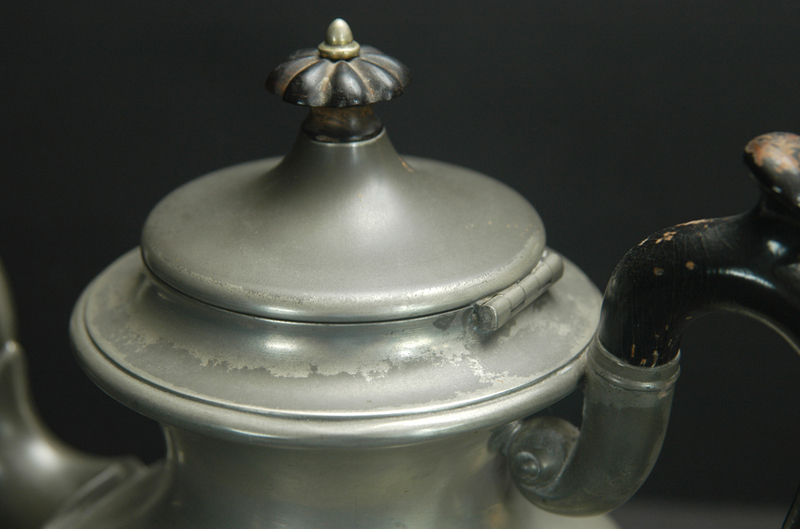 Patina is medium grey with somewhat darker patina on spout, top of lid and a bit of darkening around-step down of lid and stepped foot. 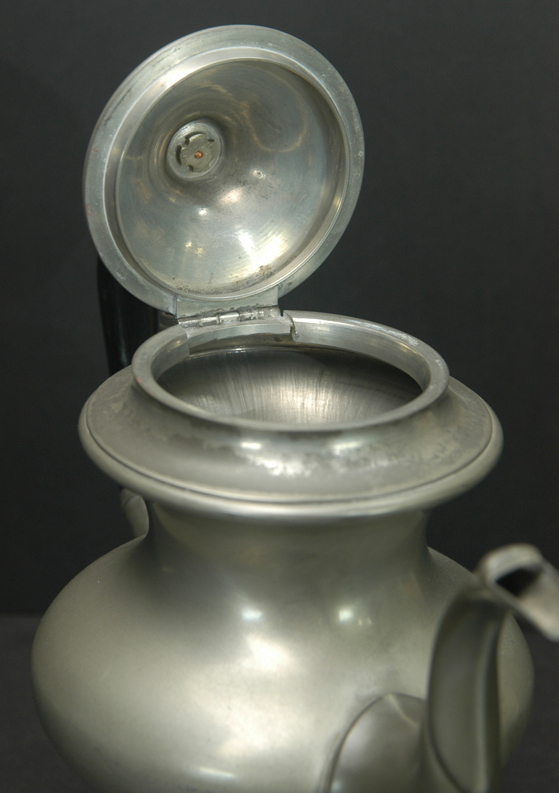 There are no obvious repairs (except possibility of finial as mentioned). 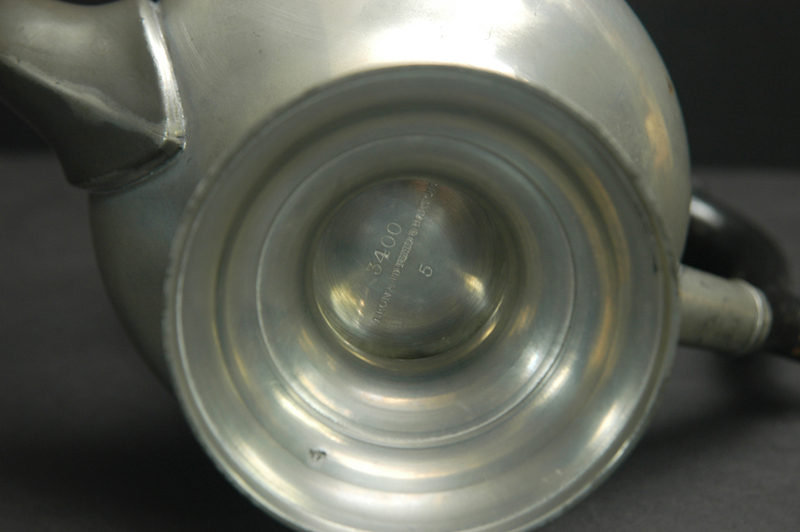 The bottom has a touchmark and marks "3400 / LEONARD REED & BARTON / 5". The very last image shows a close up of the touchmark which appears to be a bit fuzzy in the center--as if the stamp moved a little during marking. I really believe the fuzziness is due to my camera and is not in real life.....I will go and retake the photo when I get a chance (or, if I forget, when you request it....). Right now, I just need to get through my list of things that have to be finished first. Circa 1837-1845.